Below is the text written by Leigh and Karen Wyborny on December 1999. 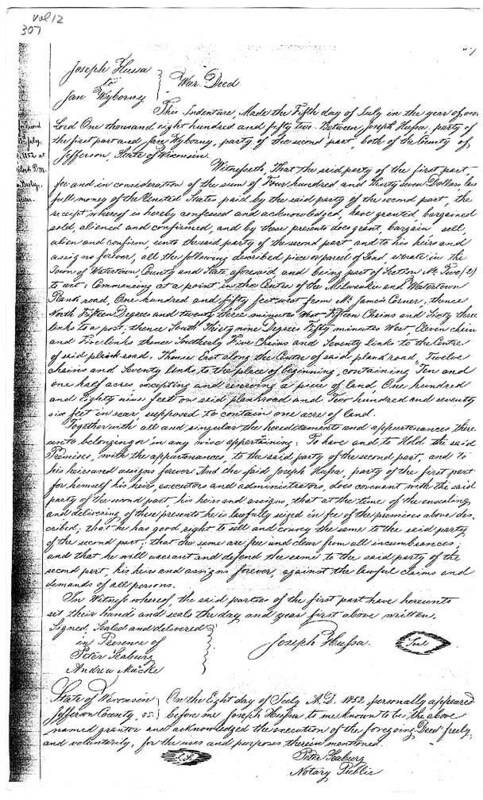 Their survey of Jan's(*1811) traces in Watertown, Wisconsin is described there. Chances of a genealogical study of even older generations are illustrated well in this description. Prior to our trip to Watertown, we contacted Roberta Lien Fosdal, a genealogist for Dodge and Jefferson counties in Wisconsin using the web site www.usgenweb.com. She was able to locate 3 deeds with Jan Wyborny’s name on them. 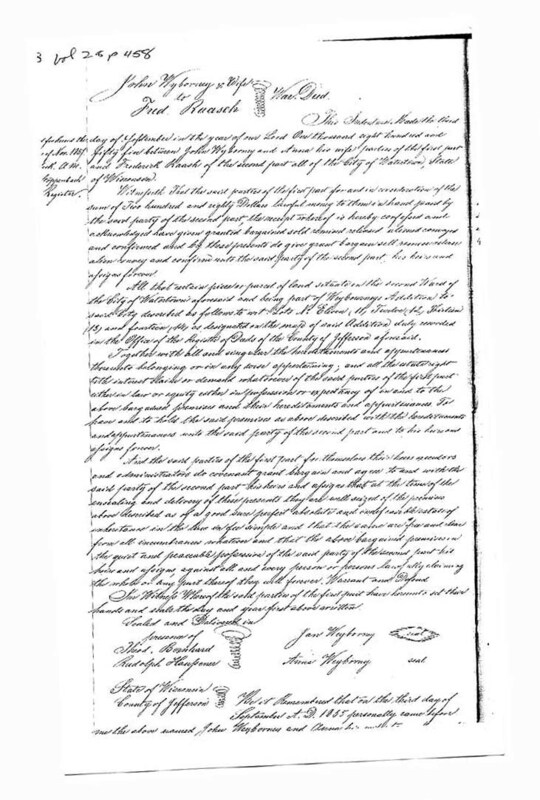 Two deeds were for the purchase of land and one deed was for the sale of land. Our first visit was to the Watertown Genealogical Society. The members were very helpful but after spending about an hour we decided that we were not making much progress. We then decided that we needed to visit the Courthouse in Jefferson some 30 miles away. 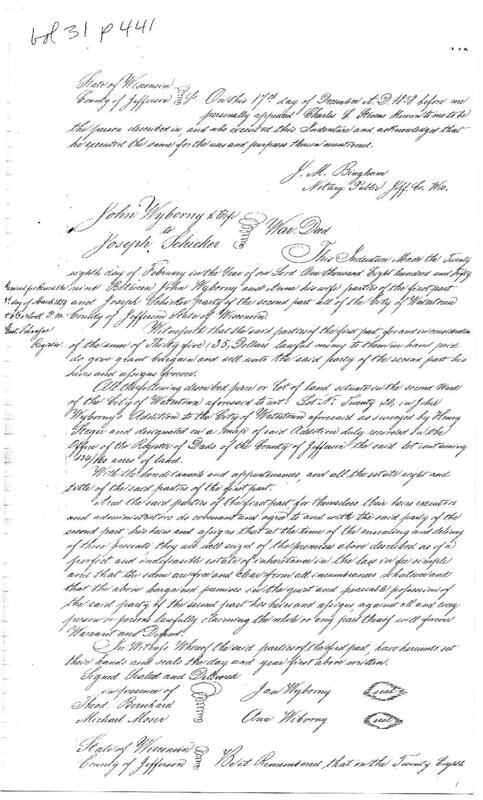 We spent the rest of the afternoon, driving to and from Jefferson and examining deeds. 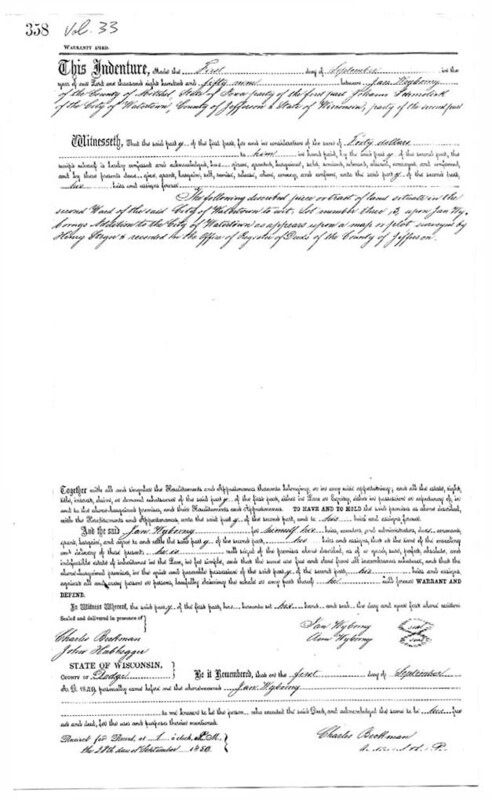 We found several more deeds for the sale of land. We spent Thursday evening with my first cousin, Kathaleen Wyborny Meinholz and her husband Donald. They now live about 10 miles northeast of Watertown in the rolling hills of Dodge County on 30 acres of land. They have built a lovely two-story house and have planted several hundred trees on the property. One of the fascinating things about the house is the feel of the country even inside the house because of the many windows. The view from the breakfast nook is spectacular with a perfectly shaped, 150 years old Oak tree centered in the windows. We were told that farmers who settled this area planted lone Oak trees in their field as a refuge from the sun when they were working the fields. Kathy grew up in Iowa but moved to Milwaukee, Wisconsin where she worked for North Central Airlines. Kathy is a co-owner of a home building business. Donald is retired from the US Postal Service and has more than a full time job taking care of their property. On Friday our first item of business was to visit the Watertown Library located on South Water Street near the west bank of the Rock River (see the map). The Rock River horseshoes through the town of Watertown. When one travels across town from west to east, one has to cross the Rock River twice. The Library is located 1/2 block west of the left side of the horseshoe. 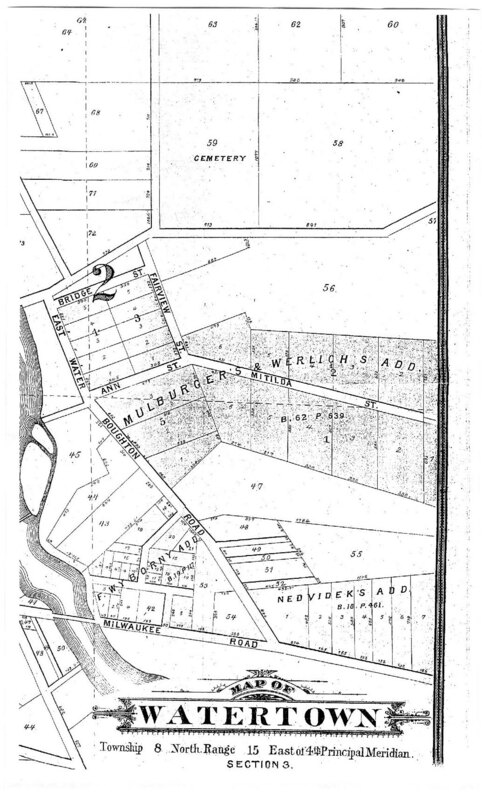 When we entered the Library, Barbara Timm, one of the ladies from the Genealogical Society, immediately approached us and informed us that she had located the Wyborny Addition on both of the old Watertown Plat Maps which are hanging on display in the Library. The earliest edition had the J. Wyborny Addition and the other one had just Wyborny Addition. They did not have any copies of those particular Plat maps or any way to make them. We therefore resorted to hunting through some other Plat books. We finally found a Plat map with the F. Wyborny Addition. The written calligraphic capital J is very hard to distinguish from a written I or F. On the same Plat maps was also the Nedvidek Addition. Mr. Nedvidek was mentioned in Bradek's biography of Jan Wyborny of Plymouth, Iowa. Our second item of business was to visit the property that Jan had bought. 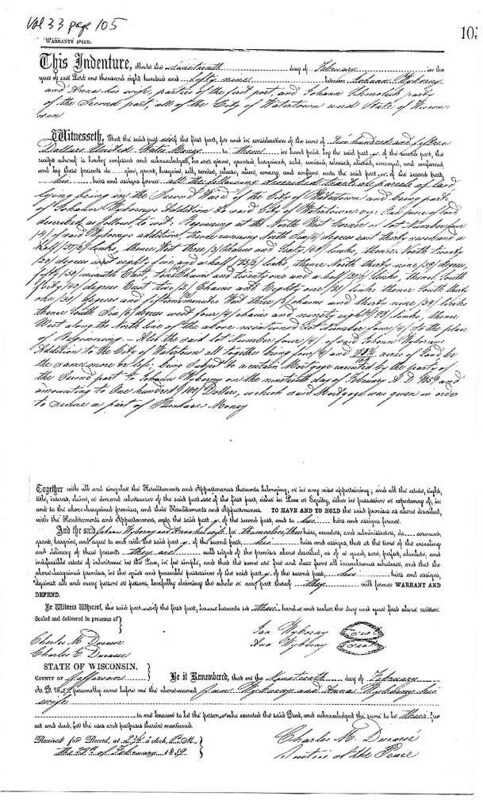 Jan's property was located to the east of the east leg of the horseshoe bend of the Rock River. The property is in the shape of an isosceles triangle. The road that runs along the south side of the property is now called Oconomowoc Avenue. When Jan purchased it, it was called Milwaukee and Watertown Plank Road and later became just Milwaukee Road. 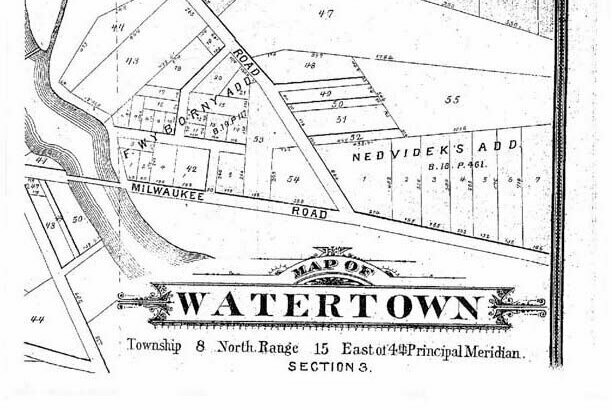 In the 1850's it was the main road between Milwaukee and Watertown and possessed the main bridge going into Watertown. The western edge of his property was the Rock River (it cuts off the left angle of the triangle). Someone else owned the property at the right angle of the triangle. In addition there was one other lot which faced Milwaukee Road that was owned by someone else. The upper right side of the triangle was Boughton Road that joined East Water Street. It is now all called East Water Street. The upper left side of the triangle has no distinguishing features. About a quarter of a mile north of Jan's property is a dam that runs from an island to the West Side of the river. This is the likely location of the Sawmill mentioned in Bradek's Biography of Jan.
We also visited Oak Hill Cemetery which is the closest cemetery to the Jan Wyborny property. Our purpose was to try to locate the grave of Jan's daughter who died in 1854. We found some markers that were of that time period but most of them were unreadable. Our next visit was to the Watertown Moravian Church. Unfortunately it was closed on Friday afternoon so we were unable to look at their records. We then revisited the Watertown City Library. As we entered, the Librarian presented us with a 1st edition copy of Dr. Eugene H. Wyborny's American Vyborny, Wyborny, Wyborney book . Eugene had donated it to the Watertown Library and Barbara Timm had located it. After spending some time searching microfilm records of burials, we decided to walk through the downtown area. There we met Mrs. Timm again. She thought that Eugene's book made reference to St. Mark's Lutheran Church. 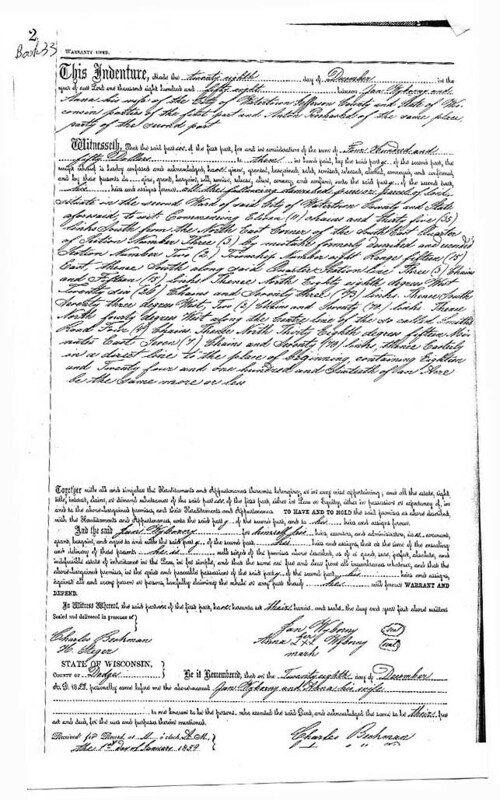 We could not locate the reference in Eugene's book but we proceeded to look at the Lutheran Church records. We found a lot of interesting material but nothing to do with Jan or his family. 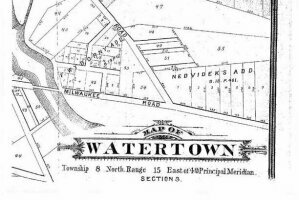 Our next project was to locate Jan in the 1855 Watertown Census. We found his listed as J. Weburney. There were 19 people in the household, 11 males and 8 females, 13 of which were foreign born. With this large number of people we assume he had a boarding house. 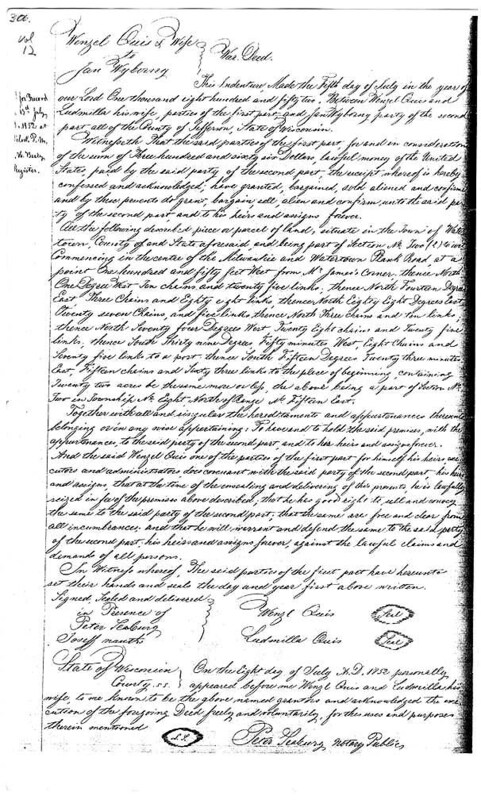 We had located this same entry several years early in the 1855 Watertown Census records in Madison, Wisconsin. 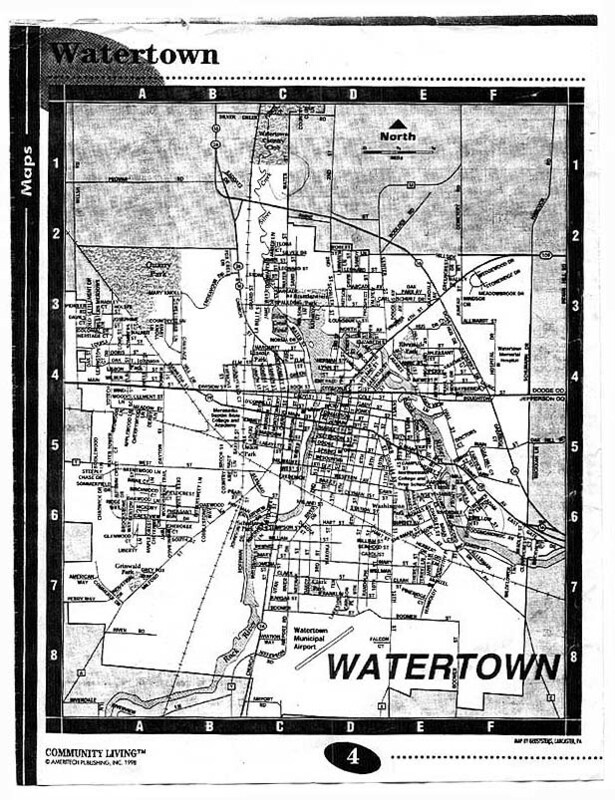 The only difference we noted was that the Watertown Census in Madison listed nationality whereas the one in Watertown does not. We spent another delightful evening with Donald and Kathaleen Meinholz. Kathy's sister, Carol Wyborny who lives at Waukesha, Wisconsin, joined us. Carol brought with her many old pictures (taken about 1900) of the Ward and Witham family members as well as many scenic pictures. Both families had lived in Green County, Wisconsin in the 1860's and 70's. The Meinholz's son Greg has put 72 of those pictures on the following web site: http://www.actiflash.com/photos/photos.html. Just before leaving Watertown, we went out to breakfast at Whistle'n Joe's with Brenda Tester, a student a Maranatha Baptist Bible College. The portions were hearty and the service was excellent. Brenda's parents are missionaries to the Chinese people of Vancouver, British Columbia. We have known her parents since the early 1970's when they worked at our Church in Houston, Texas. 4. Vol. 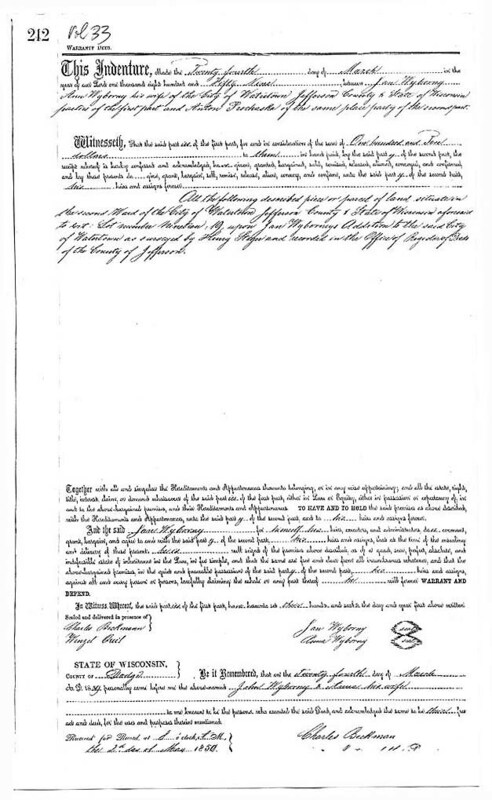 12 page 306: Joseph Hussa to Jan Wyborny, 5 July 1852, 91/2 acres for $437 (located by Roberta Fosdal). 5. Vol. 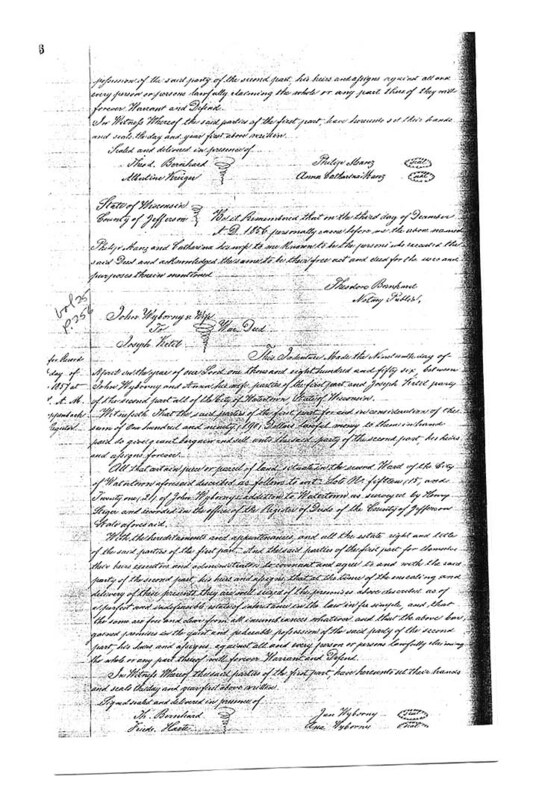 12 page 307: Wenzel Quis & Wife to Jan Wyborny, 5 July 1852, 22 acres for $360 (located by Roberta Fosdal).